Posted by jackie blue on Tuesday, May 6th, 2008 at 10:00 am. That sweater is totally adorable. I might have to make one now. Nice job with the dyeing too. It looks great! What a brilliant success! It looks fantastic. And a faint mottling will just give it visual depth. Your version of this sweater is SO wearable. I love it! And I am so impressed with your dye job. Nice work! omg, it looks fantastic!! What a great sweater and the dye job is amazing. That dye job looks great! I’ll admit to being surprised. But good on you for taking the risk. Hey, long time no talk. Just wanted to see how you are and say hi. 🙂 Wow, that sweater looks great! I love the fit and the dye job. It looks fantastic! And I think gives me the push I need to start my own dye project with this same yarn. Nice work! Wow! That turned out great! I love the new color. Ooooooh, it’s fabulous! I’m sure you’re thrilled with the way it turned out. Wow! Wow. You are one brave lady. 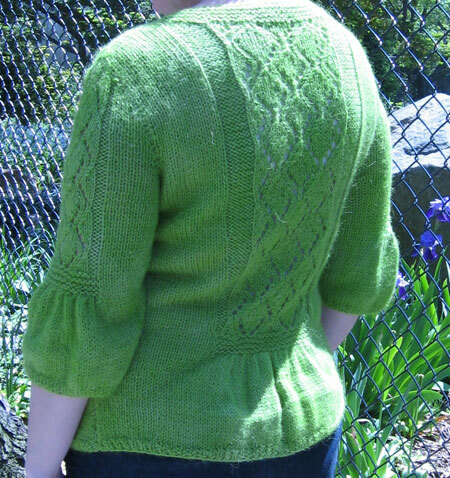 I would never have had the guts to dye a finished handknit sweater. And it’s gorgeous (on you and in general)! Maybe I’ll see it in person some day? That came out so cute! But get yourself some acid dyes. 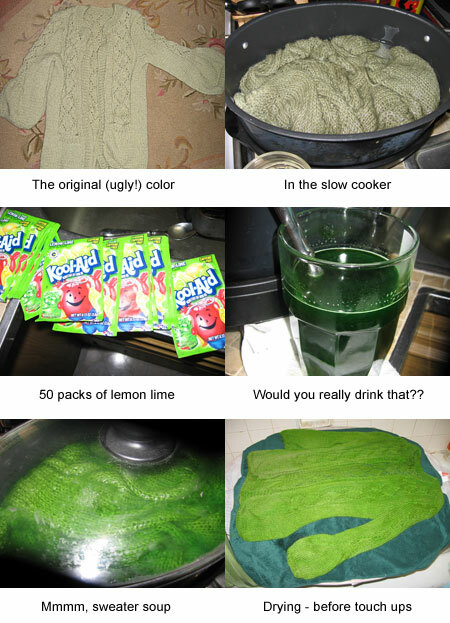 You’re going to go broke dyeing with Kool Aid. OMG! I love that sweater! It looks so cute in the happy green version, perfect for your coloring. I shall have to put that one on my list. You are one daring lady! It came out great. Awesome job! Love the limey green. It looks great, does it smell all fruity? that is delightful. and brave. Wow, I love that sweater!! 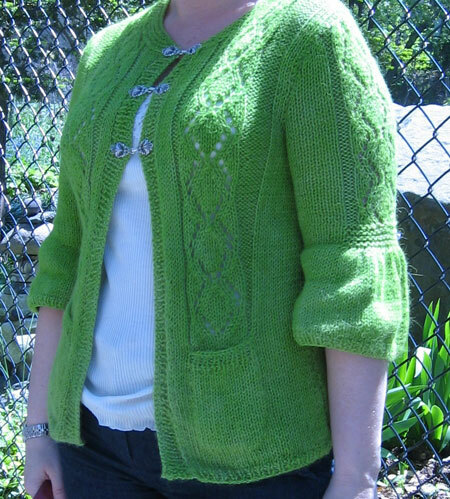 The color is amazing and the sweater itself is adorable as well! Lovely! That was brave — I’m so glad it worked. It looks gorgeous. I never dyed anything before, so brave of you. The colour is lovely. I have tagged you for the Five Things Meme if you feel like doing it.